A 63-year-old male presented with gross hematuria and visited our hospital in April 2014. Urine cytology showed adenocarcinoma cells with mucin production. His serum prostate-specific antigen (PSA) was 9.95 ng/ml. Digital rectal examination (DRE) detected a nodular mass on the right lobe. 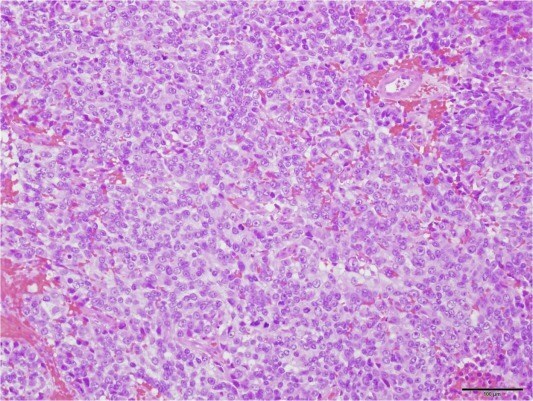 A trans-peritoneal prostate biopsy revealed a Gleason grade 5+5 adenocarcinoma. In addition, bladder neck involvement was confirmed by targeted biopsy. Computed tomography (CT) showed multiple enlarged abdominal and pelvic lymph nodes that were less than 15 mm in the short axis. Bone scintigraphy showed no evidence of bone metastasis. The patient received degrarelix acetate once a month, once daily bicalutamide 80 mg, and docetaxel (70 mg/m2) every three weeks six times. After six months of androgen deprivation therapy (ADT) and docetaxel treatment, his PSA level decreased to 0.04 ng/ml. Follow-up chest and abdominopelvic CT images showed a marked decrease in the size of the previously enlarged lymph nodes. Subsequently, the patient received high-dose rate (HDR) brachytherapy to the prostate (a dose of 22Gy in two fractions), followed by external beam radiotherapy (EBRT) to the pelvic and para-aortic lymph nodes (a dose of 50.4Gy in 28 fractions). ADT was continued through radiotherapy and thereafter. His PSA level, however, showed a gradual increase after reaching a nadir (&lt;0.01 ng/ml) in September 2015. In December 2016, he presented with symptoms of dizziness. 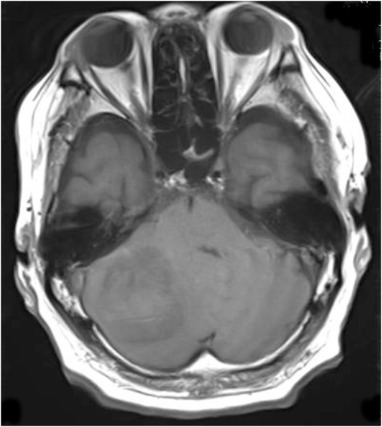 Magnetic resonance imaging (MRI) and CT examination of the brain showed a heterogeneous, multi-lobulated, intra-axial lesion in the right cerebellar hemisphere with rim enhancement and surrounding edema. His PSA level rose to 1.34 ng/ml. No evidence of extra-cranial disease was detected by a repeat staging. Right lateral suboccipital craniotomy was performed with gross total resection of the tumor. 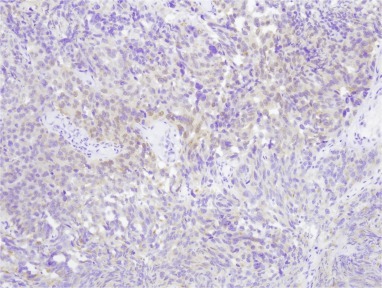 The pathological findings confirmed prostate cancer with positive immunohistochemical staining. Adjuvant whole-brain radiation therapy (WBRT) was performed. Postoperatively, his PSA again decreased to an undetectable level and remained undetectable with no evidence of new or recurrent disease over a follow-up period of 23 months.